Walden; or, Life in the Woods. Boston: Ticknor and Fields, 1854. 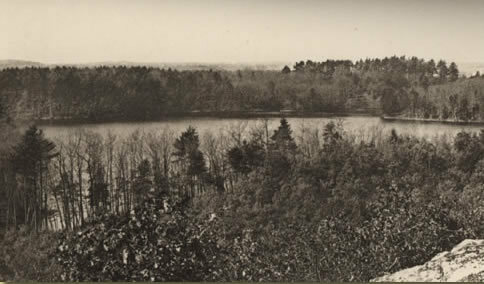 Henry David Thoreau, a nature writer and philosopher, moved to Walden Pond in 1845, living in a solitary and simple manner for two and a half years. Like John Muir, Thoreau was also influenced by the writings of his mentor, Ralph Waldo Emerson, and Emerson's worship of the natural world. From his experiences at Walden Pond, Thoreau's iconic work Walden; or a Life in the Woods emerged. Considered a "landmark in American nature writing, natural history observation, and environmental history," Walden reflects Thoreau's love of nature and his ideas concerning aspects of the human condition. Thoreau wrote, "I went to the woods because I wished to live deliberately, to front only the essential facts of life, and see if I could not learn what it had to teach, and not, when I came to die, discover that I had not lived." He sought to immerse himself in nature at Walden Pond, looking for a deeper understanding of how people should live in the world, a topic that underscores his other writings.